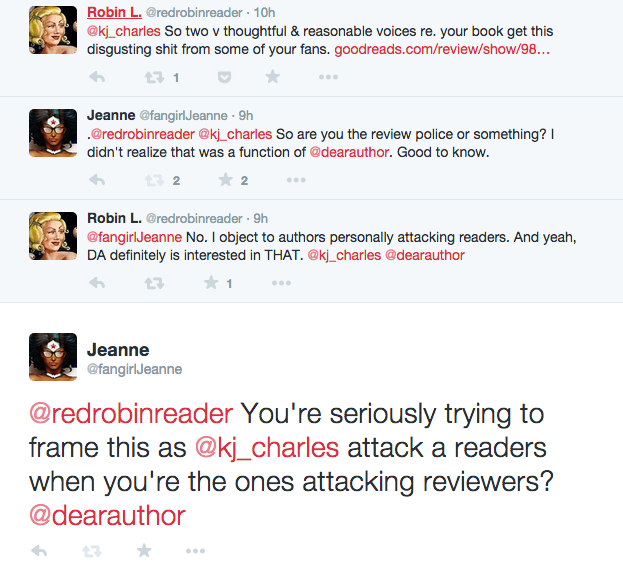 Power and Privilege in Book Blogging: Dear Author Do Better! Recently there was a conflict in the book reviewing blogosphere, involving contributors and the head of the book blog Dear Author, and their friend Ann Somerville targeting a author and book reviewer. If you unfamiliar with the conflict Alexis Hall gives a great rundown of the timeline and details. If you want a brief summary scroll to the bottom of the post. 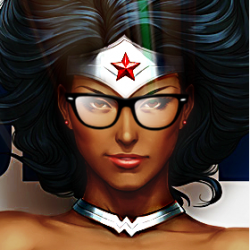 @redrobinreader on Twitter) specifically for her public targeting a gay man of color, on Twitter. On the surface, it would appear that the conflict between Sunita (@sunita_p), a cis woman of color and Julio (@agenao), a gay cis man of color, is a parallel conflict. Robin, a cis white woman, has even argued that Julio is privileged as an author, while Sunita is a “not-for-profit” blogger and book reviewer, but this framing of the situation is misleading. While a famous, best selling author can often have far more privilege and power that most book reviewers, Sunita is not just any reviewer and Julio isn't JK Rowling. The reality is that Sunita has significantly more situational privilege, created by her position at Dear Author and her powerful, privileged allies. Meanwhile Juilo’s position in publishing and the m/m romance community, not to mention as a gay man of color, is significantly lesser. Sunita is a regular contributor to Dear Author, she has a larger network of friends, both authors and book bloggers. She is well respected, and much loved by many in book blogging circles, many of these people are women (many are white and heterosexual) in places of significant influence not just in the m/m romance, but in the wide Romance community. She has many powerful, privileged allies, who specifically in this incident acted on her behalf. That’s power, a lot more power than Julio has, as we’ve seen first hand in how Sunita’s privileged friends have been attempting to shape the narrative in her favor. So what we have here is a group of primarily white cis heterosexual women actively dehumanizing and harassing a gay man of color. Ironic, considering this is happening in the m/m romance community, a genre where publishing disproportionately favors cis white women authors, despite the focus of the genre primarily being on gay men. A small amount of research will show that the majority of best selling m/m romance authors and book bloggers are cis white women, despite the fact that there are a lot of gay and trans men writing and reading in the genre. It is an indisputable fact that cis white heterosexual women occupy seats of power in the m/m romance genre. While, I’ve seen many of these women take their responsibility and privilege very seriously, many championing LGBTQA+ charities and actively engage in social justice. There are those who do not recognize how powerful, and potentially dangerous they can be to LGBTQA+ people. It’s important to understand, that while women do experience oppression and marginalization, they can still be privileged in situations with men, especially in cases where cis heterosexual white women are in positions of power among LGBTQA+ people. Even when marginalized people are in conflict with each other their friends and allies need to take their own privilege into account before getting involved. A privilege person walking into a parallel conflict between marginalized people is bringing a gun to a fist fight, someone other than them will get hurt, maybe even the friend they were trying to protect. Marginalize people can easily and even unintentionally weaponize our allies against other marginalized people, sometimes just by having public disagreements. This happens because our friends and allies often see us as extensions of themselves. They view attacks on us, as an attack on them, and can view their action against another marginalized person as justified because they’re doing it in our name. This can also blind them to how their own internalized bigotry might be driving their actions and quick judgements in the situation. As a marginalized person I’m actively trying to take this into account when dealing with other marginalized people. I recognize that I need educate my friends, and even warn them away if I get into parallel conflicts. I don’t need my friends to protect me, but more importantly I shouldn't leverage the privilege of our friendship against marginalize people. That's not what friendships is about. I do think it’s important for privilege people to call each other out, that is how allies are supposed to help us. To back us against other privileged people, but they should also strive to NOT attack people with less privilege than themselves, even when they don’t like those people. Even when those people might be attacking their friends, people need to be cognizant of how their privileges and how the minute they walk into the conflict it becomes an unfair and even dangerous situation. Side note: If you ask a privilege friend to stay out of a conflict and they attack other marginalized people in your name anyway, end the friendship immediately. That sounds harsh, but most likely that person isn’t a real friend or ally. They are probably using their relationships with you to justify targeting marginalized people, and soon enough you’ll end up on their hit list. In this case, a woman of color, Sunita, made an unsubstantiated allegation against a gay man of color. He defended himself, and Sunita’s privileged friends harassed him on her behalf. While Sunita’s actions are extremely problematic, they do not justify or excuse the actions of privilege women who CHOSE to target and vilifying a gay man of color in a public forum. The fact that Litte spoke out on this issue without doing even the smallest amount of research, like asking the parties involve if they are friends, is only worsening an already terrible situation, and continuing to make Julio a target of harassment. It would be so much easier to acknowledge the mistake everyone made and apologize, but so far that doesn’t seem likely. So where does that leave us? Well, for me until Somerville, Sunita, Robin, and Dear Author apologize for their actions I can’t trust them as allies and I can’t view Dear Author as a safe space for anyone, but them and their friends. I’ve unfollowed them, but maintain the hope they will make things right. I will be preparing an email to send to Dear Author, urging them to look into the situation further, and publicly apologize for their involvement. Once it is done I will also post it publicly on here and Tumblr. I urge you to do the same. Until they apologize, I’m going to stick to the LGBTQA+ book bloggers and authors I know, and seek out more to add to my list of safe places where we have a voice and are shown respect. Feel free to share your recommendations for LGBTQA+ friendly book bloggers and book recommendation sites. I’m putting together a big post with everyone I follow and recommend, and would love to add your recommendations. ETA: After some thought I wanted to come back and really emphasize something VERY important to remember. Yes she did post baseless accusations, and feel free to hold her responsible for that. However, she is NOT responsible for the choices made by Ann Somerville, Robin, and even Jane Litte, among many others, to attack Julio on social media. These are grown women, who made and continue to make the choice to target a gay man of color. DO NOT attack or hold Sunita responsible for the actions of her privileged friends and supporters. They, and they alone are responsible for their own actions. She is not. Ann Somerville (author and blogger) wrote a post addressing a flaw in how KJ Charles’ book Think of England dealt with racism. Sunita (book reviewer and contributor to Dead Author) posted a companion piece on her personal blog wherein she accuses Julio Alexi Genao (author and book reviewer) of “gaming the system” on GoodReads in order to support KJ Charles. Sunita believed, without any supporting evidence, that Julio was a fan/friend of Charles, and asserted that his alleged actions were an example of “bankrupt critical culture.” As it turns out this was not the case at all, Julio just liked the book and his review happened to be at the top of the book’s profile page on GoodReads. Someone notified Julio about Sunita’s post and accusation, via the comments on his review. He and several of his friends had a lively dialogue about the accusations, as well as the tone of both Sunita and Ann’s posts. Ann and Sunita saw the conversation happening in the comments of Julio’s review, and took to Twitter to share all the unsavory things being said about them by Julio and the other commentaries. Then both women deleted their Twitter accounts, and Sunita set her blog to private. Believing Sunita’s false allegation, that Julio was a friend/fan of KJ Charles, Robin L. (contributor to Dear Author) called out Charles on Twitter, linking directly to Julio’s GoodRead’s review, and demand she put a stop to Julio’s actions. Charles replied to Robin’s allegation saying she had no knowledge of what had happened, and that it was her policy to not comment on reviews. At this point, I replied to Robin, because I had only see her part of the greater scope of harassment. I called her out for targeting Julio, a gay man of color, by publicly linking his review on Twitter, explaining she needed to take her privilege into account before putting a marginalized person in the line of fire. Robin maintained that since she was defending a person of color, Sunita, she was not in the wrong and then claimed that Julio had more power than Sunita who was a “not-for-profit” blogger. Currently (12/23/14) neither Ann Somerville, nor Sunita have returned to Twitter. Sunita’s blog remains set to private. Jane Litte and Robin maintain their stance, and Julio is still a target of harassment.